BESIDES BEING A PRIVATE GYM WITH NO BIG CROWDS, WE WILL DELIVER RESULTS. DON’T BELIEVE US? SCROLL DOWN AND READ THE STORIES. 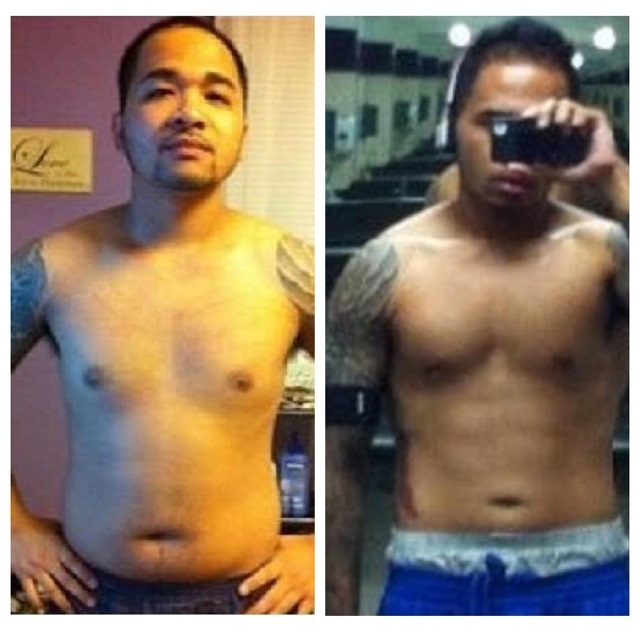 We want to recognize our trainer Sy’s client’s 10-month transformation with a 3 lb weight gain! Liz began training at our private facility not to lose weight, but to become stronger and relieve some stress because it made her feel good. 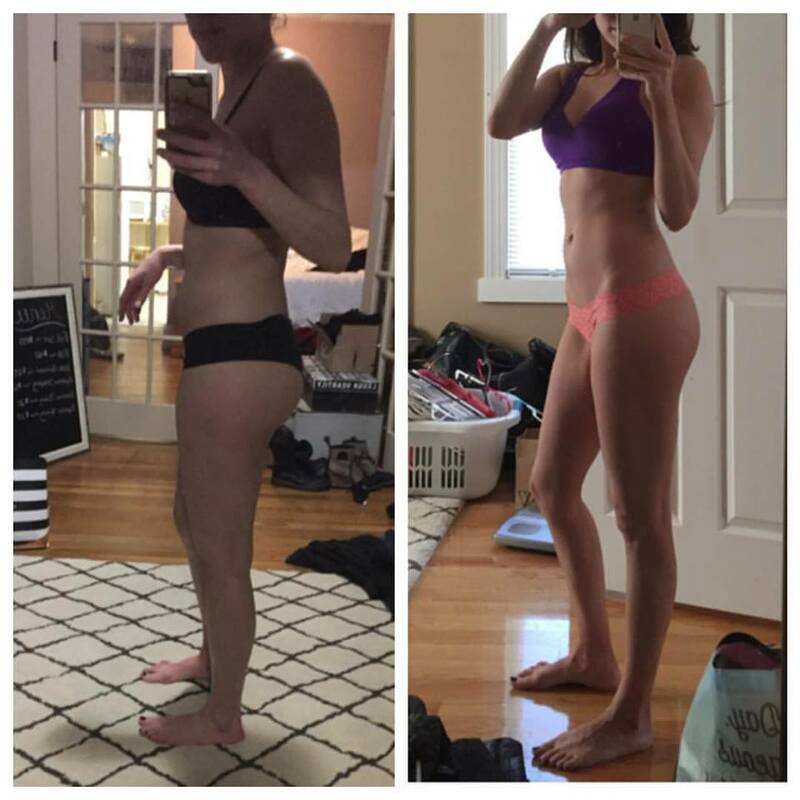 Her 10-month transformation with Evolution Fitness involved proper nutritional education to consume the correct amount of food. 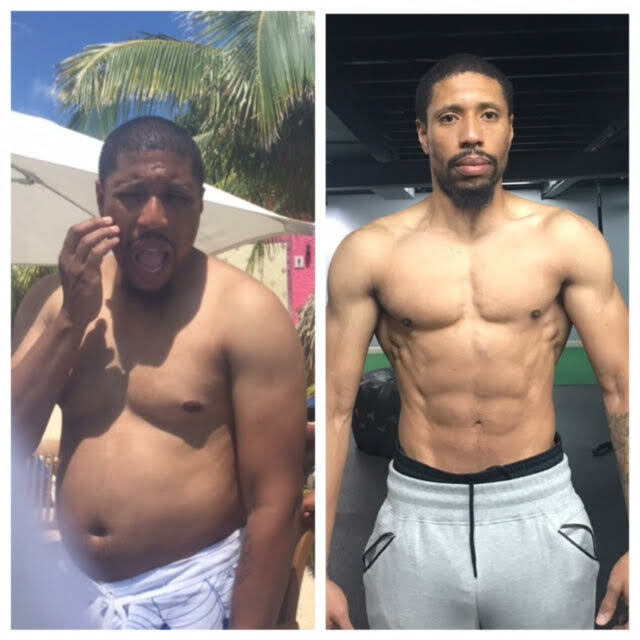 It also involved pre and post workouts, proper lifting and form techniques, consistency and sheer determination with the help of Sy. Keep up the gains, Liz! Ladies, please note that lifting doesn’t make you bulkier. It gives you even more strength, definition, tone, a nice physique, confidence and most importantly, a healthier lifestyle. Great job! Here is Josh, one of our clients that lives in Massachusetts. It’s clients like him that make us passionate about the Evolution Fitness brand. He drives 90 minutes to meet with his diet coach, follows the fitness plan and makes no excuses. Josh works 60 hours a week as a Corrections Officer and still makes time to prepare his meals and go to the gym faithfully. 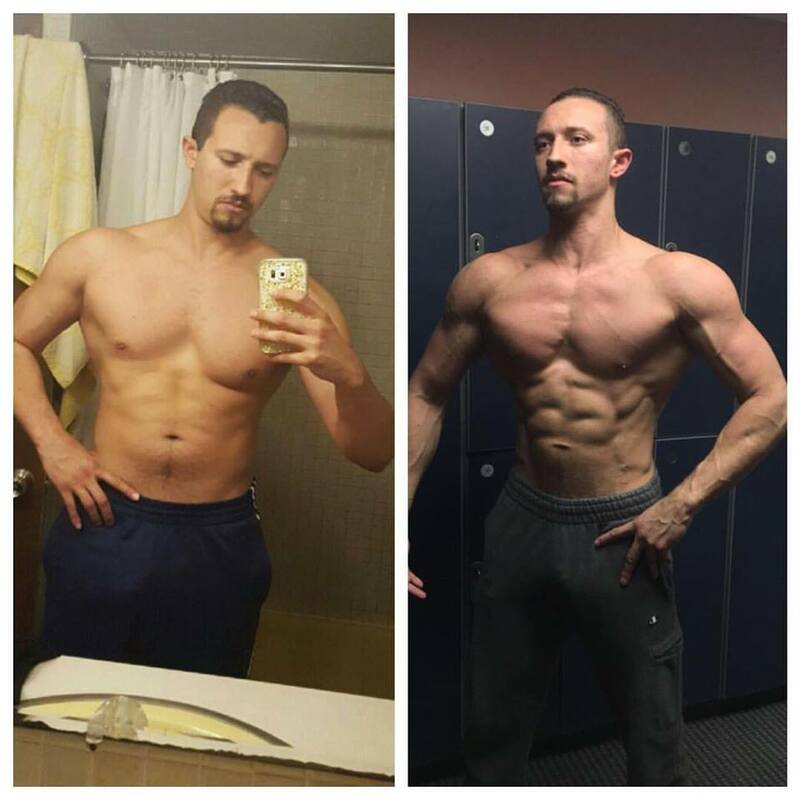 The picture on the left is when he first met T. Chan and he wanted to do his first NPC Men’s Physique fitness competition. He had heard a lot of great things about Evolution Fitness and was recommended it by a friend. Four months of Josh’s hard work has paid off and he will be stepping on stage in a couple days for his first show. No matter what the outcome may be, we are extremely proud of his accomplishment in such a short period of time. Good Luck, Josh! 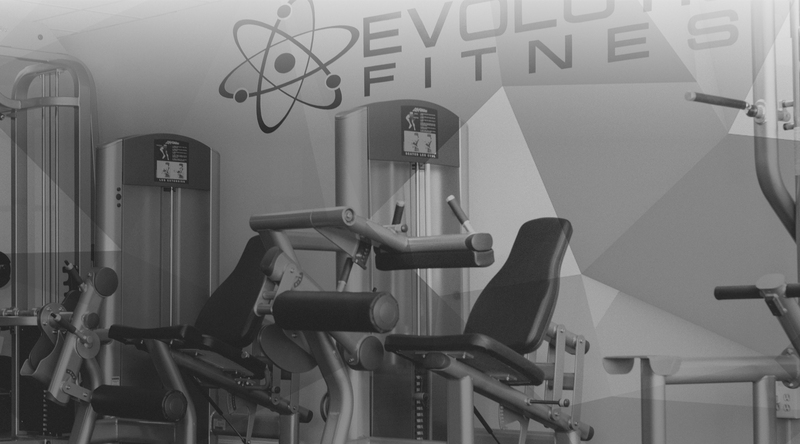 Let’s bring a trophy back to Evolution Fitness! 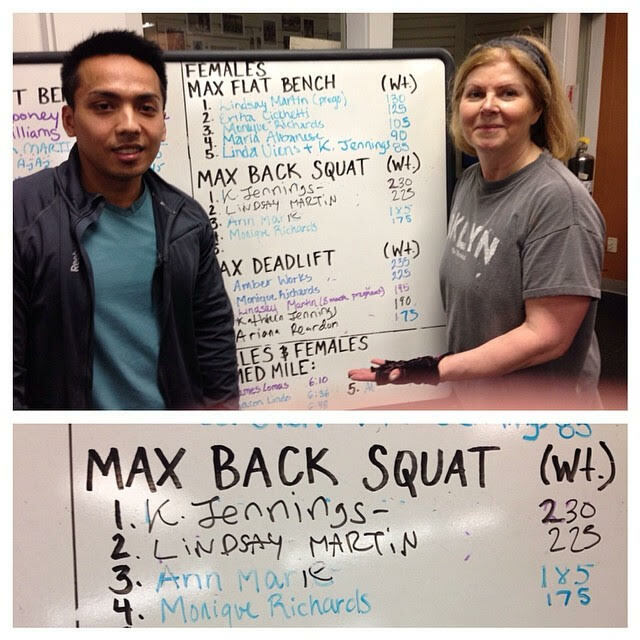 Huge congratulations to our dedicated client Kathy for holding the one rep max record for barbell squatting 230 lbs. and the one rep max record for sumo deadlifting 255lbs.! Although she is 61 years old, she does not use her age as an excuse. She has been weight training with us for two years and has put on 10 lbs. of muscle while dropping her body fat by 8%. Believe it or not, she wasn’t always this athletic. When she first started working with T. Chan, she could barely do a walking lunge without losing her breath. In her exact words “I would never imagine myself being at this age, and becoming addicted to weight training”. She made a commitment to change her life and here she is, never looking back at her decision. It’s safe to say that 60 is the new 40! Keep up the good work Kathy! Meet Alex, one of our latest success stories. She comes from a very athletic background as a cheerleader on a baseball team. Strength and conditioning were among her strong points. The only issue was her eating habits, as they made her body fat increase. Although she had great athletic genetics, her body composition wasn’t responsive. She started her customized diet program with the expertise of T. Chan’s guidance. And here she is now, 5 inches smaller on her waist and 15lbs. down in 6 weeks. Aaron is currently 2 weeks out from his first Men’s Physique show in Boston, MA for the NPC New England Championships. He has been getting coaching/dieting with T. Chan for the last 5 months and we must say that he is 100% ready to make his debut! Don’t you all agree? During this contest prep, he did everything that was advised by his coach to make sure he brings his best package, leaving no stones unturned. Good Luck Aaron your coach is extremely proud of you! 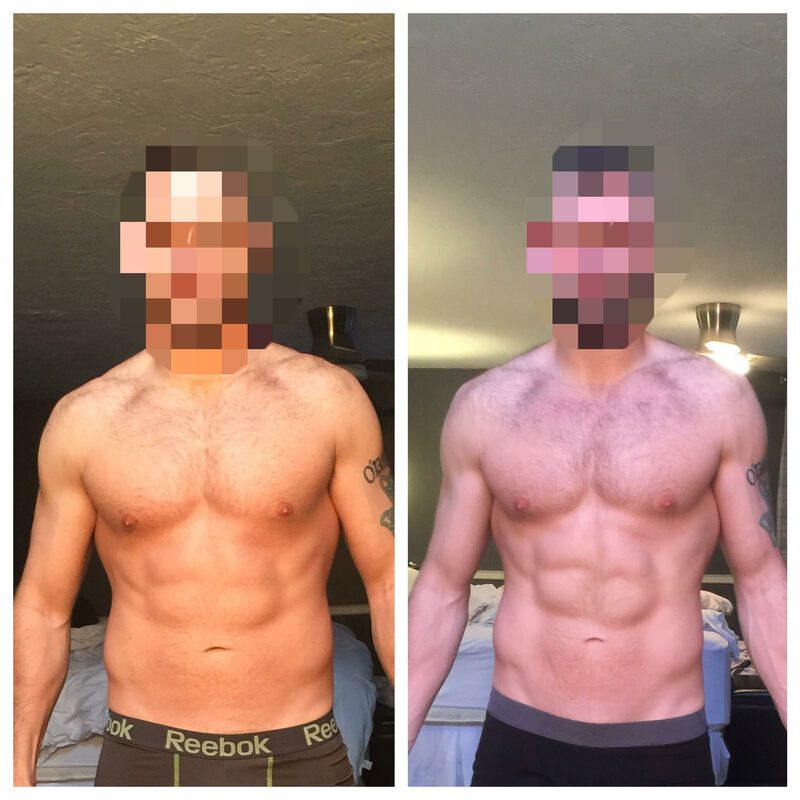 Here is a 6-week transformation from T. Chan’s online client. It’s a great transformation with all of her hard work and his diet coaching. No starvation diets, heavy weight training (wait, weight training doesn’t make girls bulky? ), moderate amounts of cardio, and no fancy camera angles. Keep up the great work! Let’s crush those squats! Brianna is one of our trainers at Evolution Fitness who practices what she preaches. Whatever she recommends to her clients, she does herself as well. Brianna is not one of those trainers that tells her clients to exercise and doesn’t follow that lifestyle herself. Here is proof of her dedication of when she decided to compete in her first NPC bikini competition. 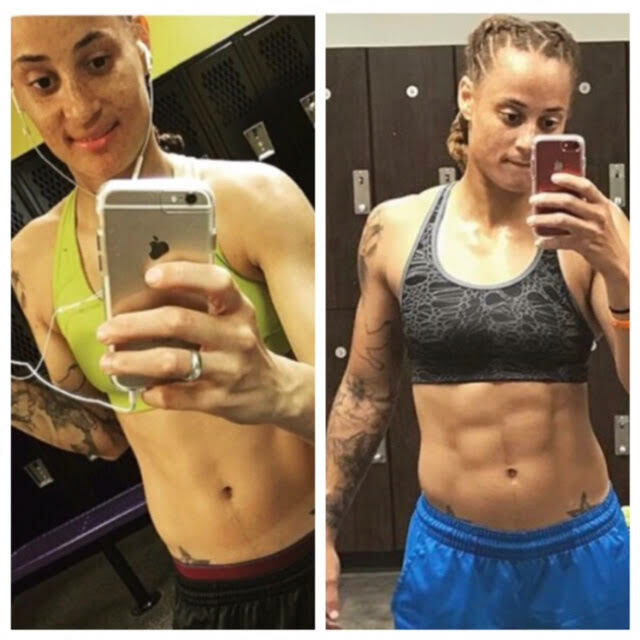 Although she has been working with T. Chan for 12 weeks prior going into the show, this is a picture of what 6 weeks can do if you’re dedicated to your fitness goals. We can’t wait to see how you do at your first bikini show. Good luck from all of the Evolution Fitness staff! Kenny met T. Chan at a restaurant that they both worked at for about two years. At this time, T. Chan was a personal trainer part-time at a gym while working as a waiter, and Kenny was a full-time busboy. They worked together a lot and got along well. Eventually, they both stopped working at the restaurant, yet they stayed friends and kept in touch. Kenny always had a passion for fitness because he loved the way it made him feel after working out. He saw the many success stories on the Evolution Fitness social media pages and was interested to learn more about how T. Chan got his clients there. 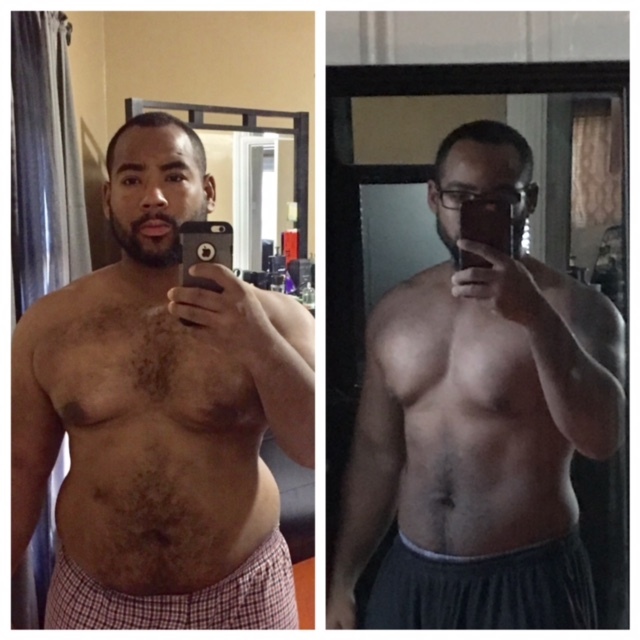 Six months later, Kenny is down 40 lbs. of fat and put on 10 lbs. of muscle mass. In addition to this, he lost 8 inches off his waist. We decided to stop the fat loss journey and instead focus more on gaining muscle. Updates will be coming soon! Jayro has worked with a couple other nutrition consultants in the past and has got mediocre results. He was hence a little skeptical about working with Evolution Fitness. We totally understood and never pushed it upon him. After seeing how attentive and knowledgeable T. Chan was, he decided to give it a shot. We must say that he made it look really easy. With all of his hard work and dedication, 10 weeks later and the abdominals were showing! Jayro has recently moved to sunny California; we wish him the best in his new residence! What an amazing 11-week transformation! This was done with the guidance of her coach T. Chan. She lost a total of 20 lbs. and kept every lb. of muscle mass! 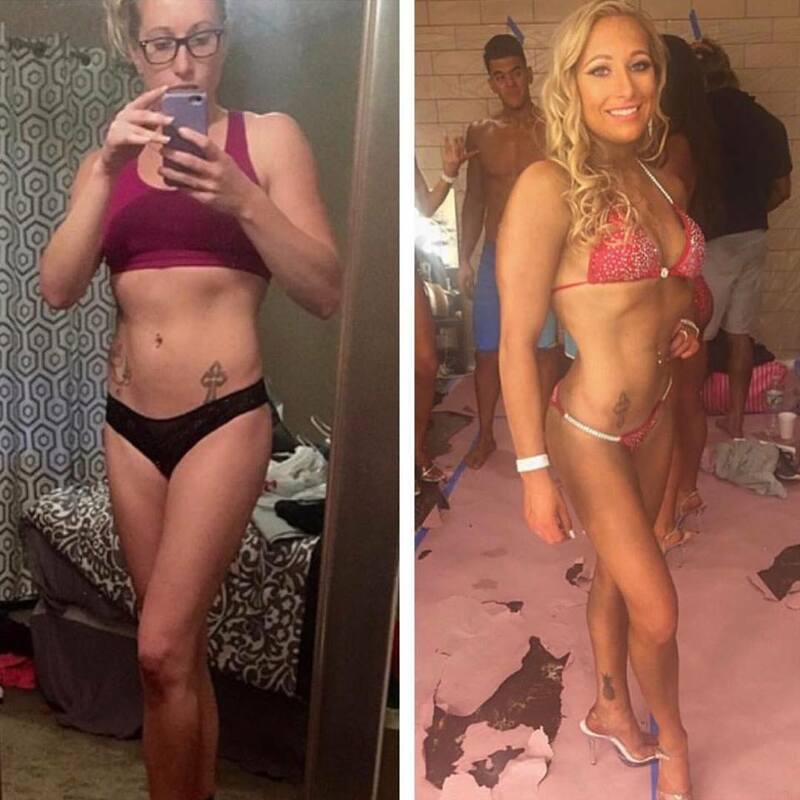 She went from eating/drinking anything to going on stage for her first NPC Bikini Show! What a great achievement to be done in a short amount of time. Coach T. Chan is extremely proud of her; she really showed her true character during some tough times and did whatever was needed to become stage-ready. 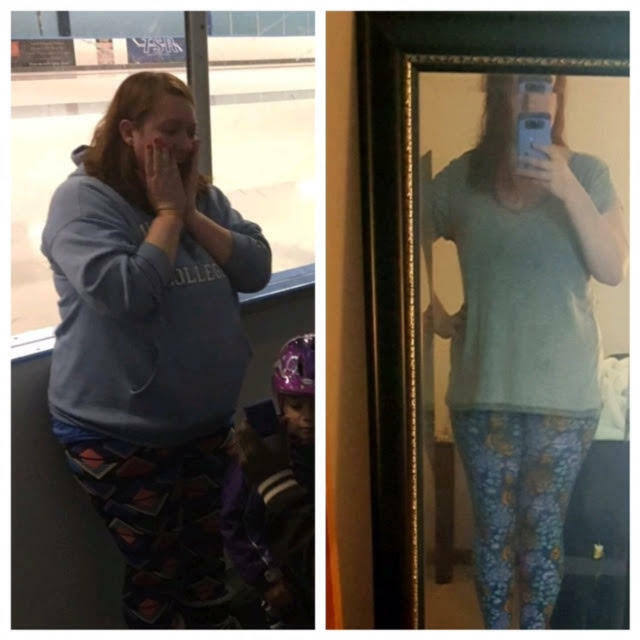 She set a goal for herself and crushed it! Did we forget to mention that when she isn’t in the gym working on her fitness, she is helping/saving patients as a full time registered nurse? If she doesn’t motivate you to get yourself in the gym, we don’t know what will! Wow! 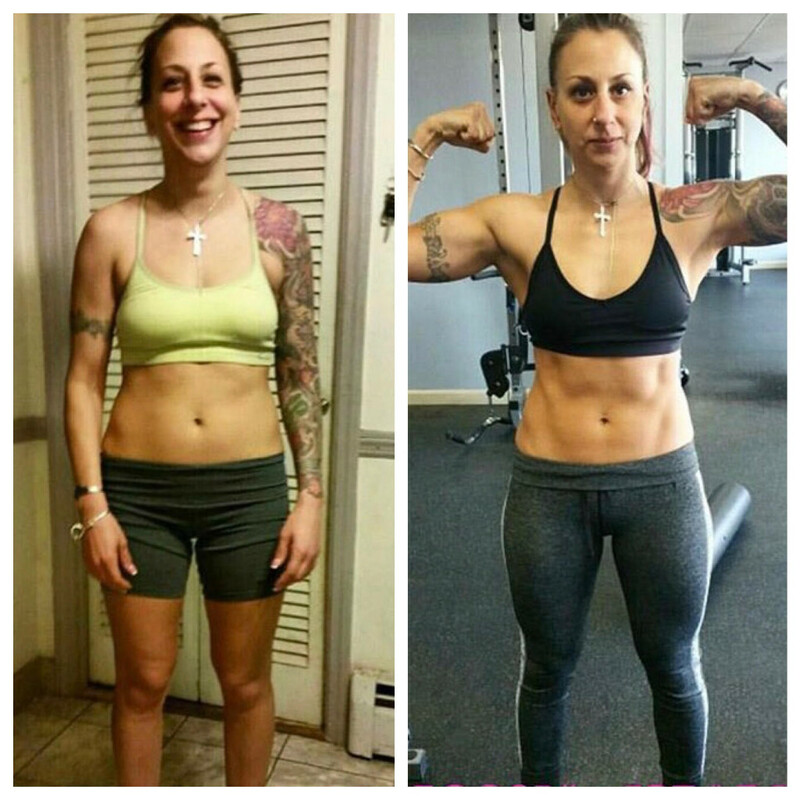 Let’s highlight Samantha as one of our many proud transformations here at Evolution Fitness. The picture below is a 6-week transformation! You read that right – 6 weeks! Although it was an 11-week prep, we do not have any photos of the first week. T. Chan is super proud of her optimism, determination, and enthusiasm. Samantha is a heart transplant recipient and her body physically changed from her procedure but she didn’t use this as an excuse. With her new outlook on life after the surgery, she knew how important her health was, appreciating the value of life. 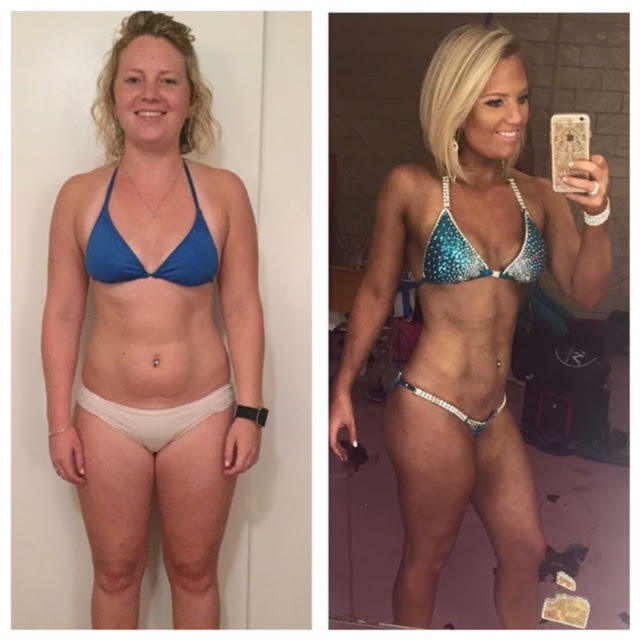 She set a goal to become fit and step on stage for an NPC Bikini Show. Samantha puts in hard work at the gym and stuck to her diet vigorously during the transformation. She inspires us to never let those small bumps in the road get us down. Whatever obstacles get in your way, you can and you will overcome them! Your coach is excited to see what the future brings! Keep up the great work! You are a huge inspiration to us! 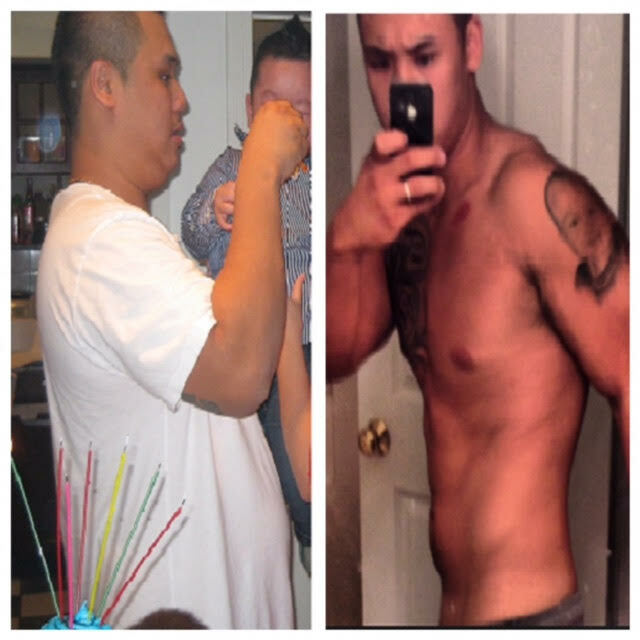 Here is Khang’s unbelievable story: He started his weight loss journey and weighed over 300 lbs. (picture on the left). Being only 5 feet 4 inches, it was really tough for him to perform daily activities and minor movements would hence have him winded. He knew if he stayed this weight any longer, it would lead to many health problems. It was time for a change and he dieted himself down to 244lbs. Still, no matter what he did, he couldn’t get past 244 lbs. One evening in a local gym, he met one of T. Chan’s previous clients who highly recommended Evolution Fitness. Jonathan Vasquez is one of the first trainers that worked at Evolution Fitness. He always had a passion for fitness and later on made it a career. While growing up, he was known as the “fat kid” – you know, the kid that would get picked on for his weight. After struggling for many years, he decided to take initiative and change his life forever. Jonathan spent countless hours in the gym and was eating for results and not for taste. Although he had a lot of weight training experience, his knowledge of nutrition was minimal at the time. Later on, he was introduced to T. Chan, and they become great friends. Jonathan starting to diet with the guidance of T. Chan and it produced awesome results! Jonathan is now currently training and dieting clients of his own. Jordan is one of our online clients that lives in Boston, MA. 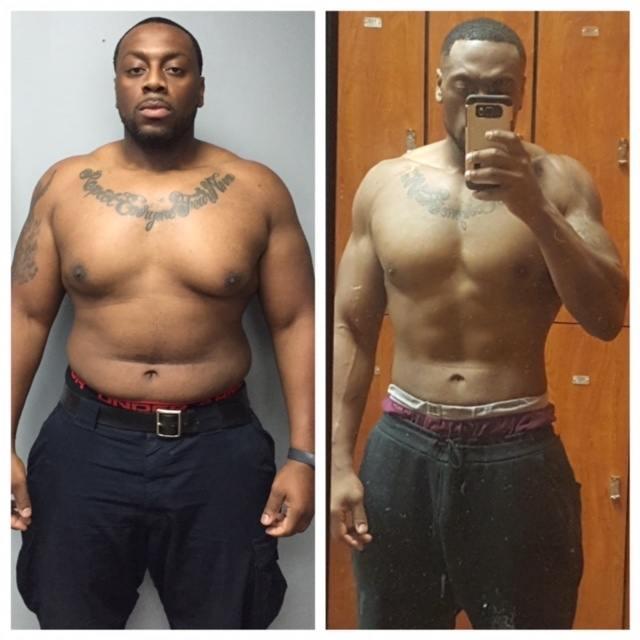 He started his own fitness journey and reached a plateau. 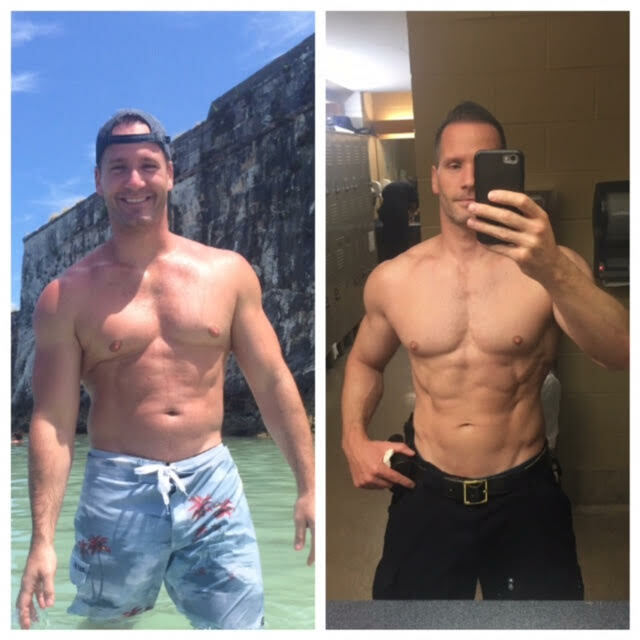 After seeing tons of success stories on the Evolution Fitness social media pages, he decided to contact T. Chan and asked him multiple questions about how the online coaching program worked. T. Chan answered all his questions and quickly figured out what his problem was and why he was plateauing. Jordan signed up for the online coaching and the body fat started to melt off of him. His problem was undereating, and he slowed his metabolism down. In the picture on the left, he weighed 240lbs. and in the picture on the right, he weighed 190 lbs. His total weight loss was 50 lbs.! Check out this great 6-week transformation! 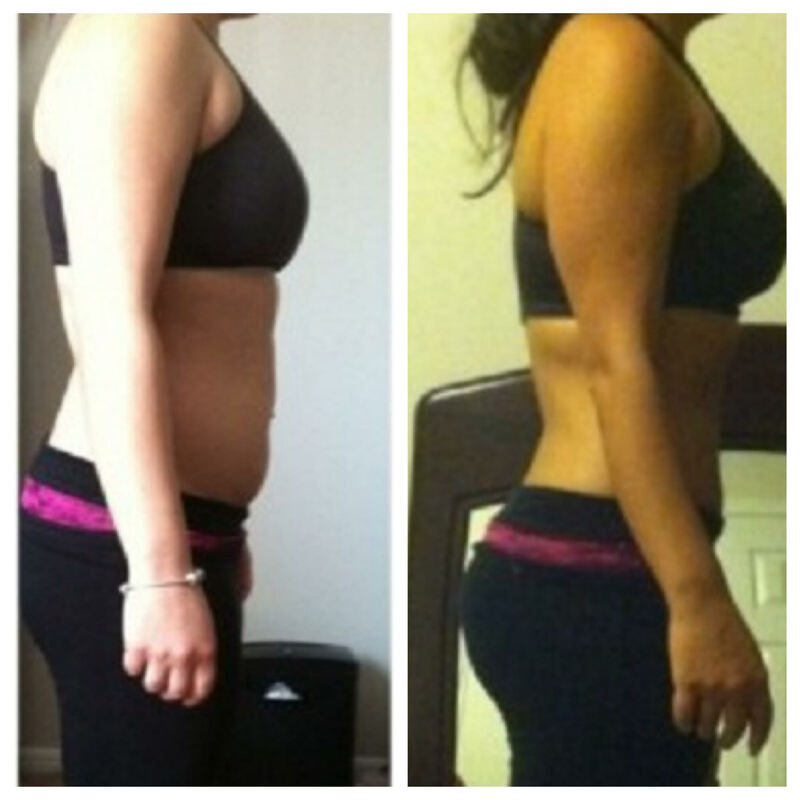 In both pictures on the left, our client Monique weighed in at 127 lbs. In the pictures on the right, she weighed 117 lbs. 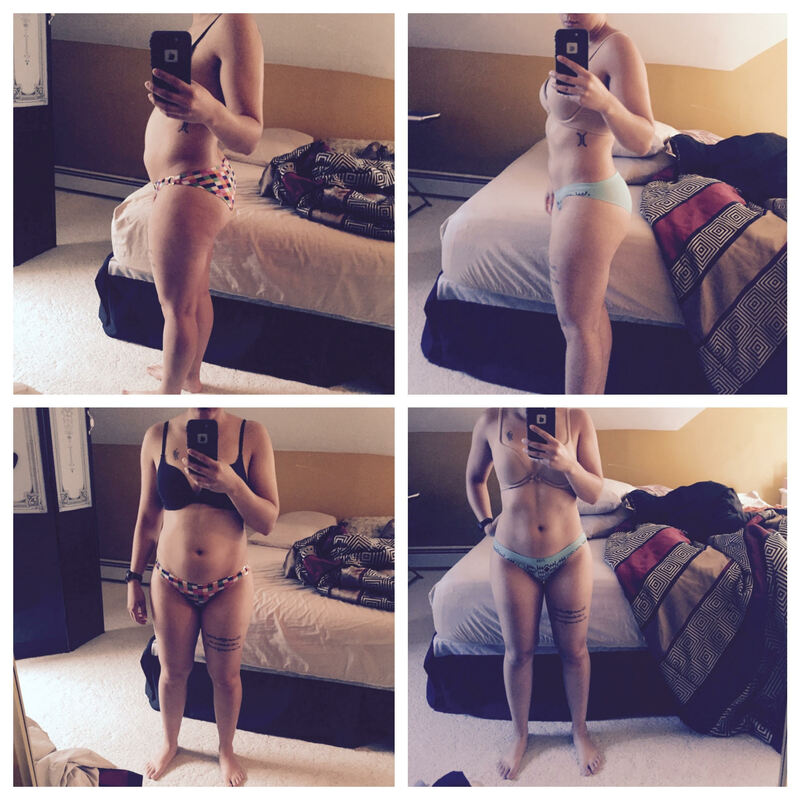 Her goal was to decrease her body fat and maintain as much of her frame as possible. How was this goal accomplished, you ask? Personal training 2x a week with Jonathan Vasquez, dieting and coaching by T. Chan. Motivation and Determination by Monique. Are you ready for your Evolution? All of our success stories have a different outcome and inspirational message. Some take longer than others and some are still trying to get to their desired fitness goal. 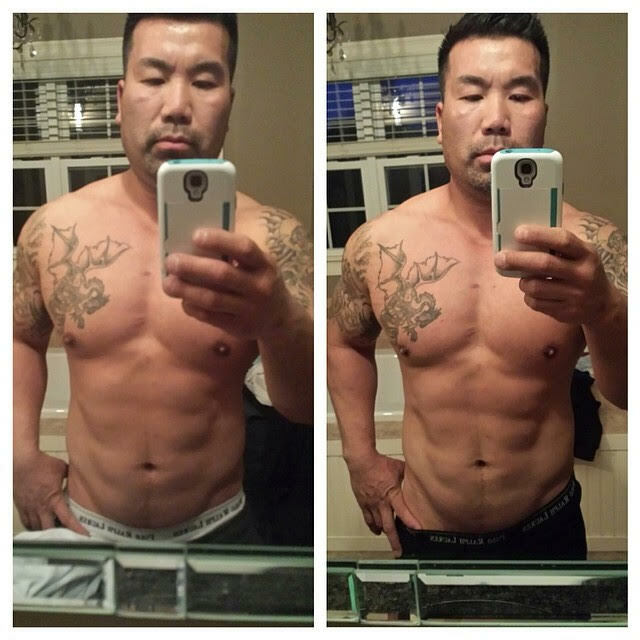 It’s kind of crazy, for as long as T. Chan has been dieting clients, the end results always amaze him. With guys like James, we wish we could do our job as a fitness professional for free. 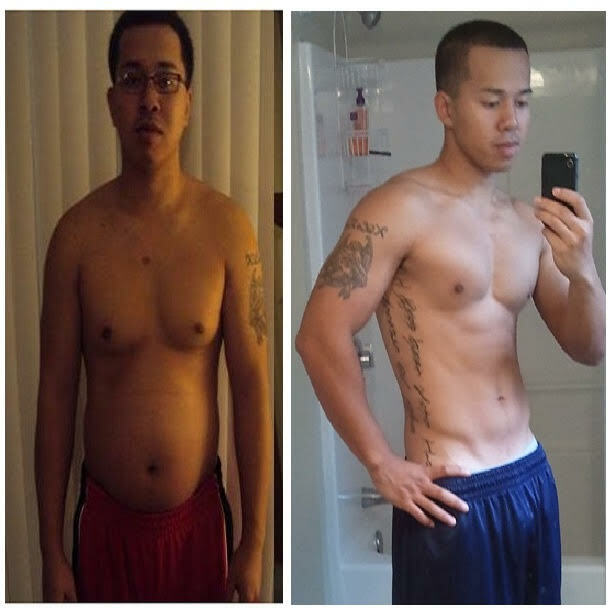 T. Chan has been working with his friend/client for 14 months and he has lost a total of 80 lbs.! The picture on the left he was weighing close to 300 lbs. and now on his way to breaking into the 200 lbs.! The dedication James has inside and outside of the gym is unmatchable. He has been a pure inspiration to T. Chan and others. Despite some of the setbacks we had during this diet prep, James doesn’t make a bunch of excuses, he always came back with a positive outlook and more determination. It takes a lot of discipline to take charge of your life and make a change. Also, he has proven that his change will help others get inspired to live a healthy lifestyle. T. Chan thanks you for trusting the process. Keep up the great work, you have a bright future ahead of you! P.S. You will be a great father! After partying every night for years and letting himself go, Mike reached a point in his life where it needed a change. Mike was never a gym guy, and he was new to the world of weights. 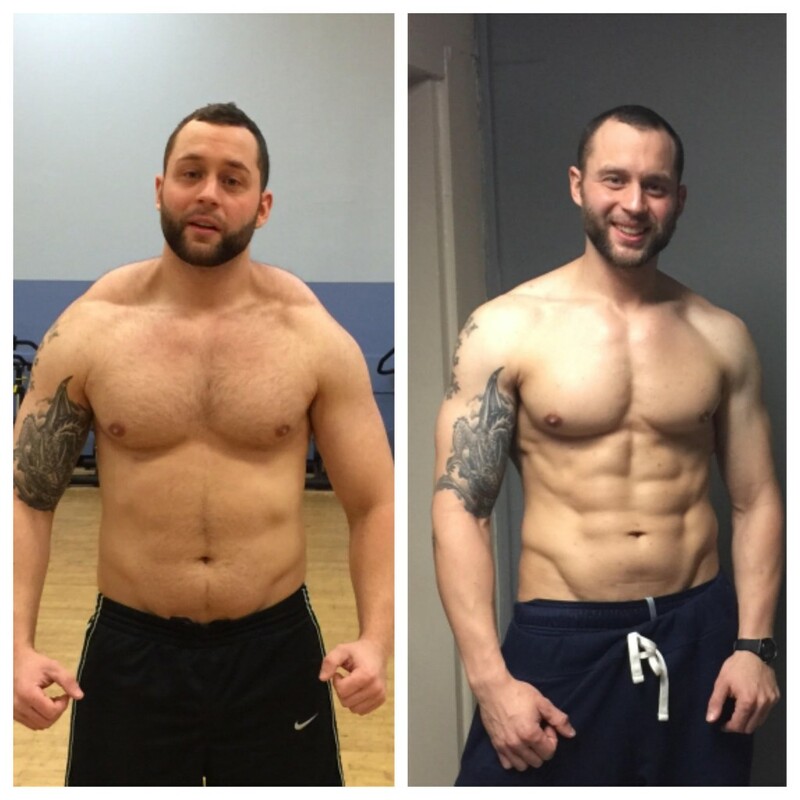 His thoughts changed after personal training and dieting for 6 months. 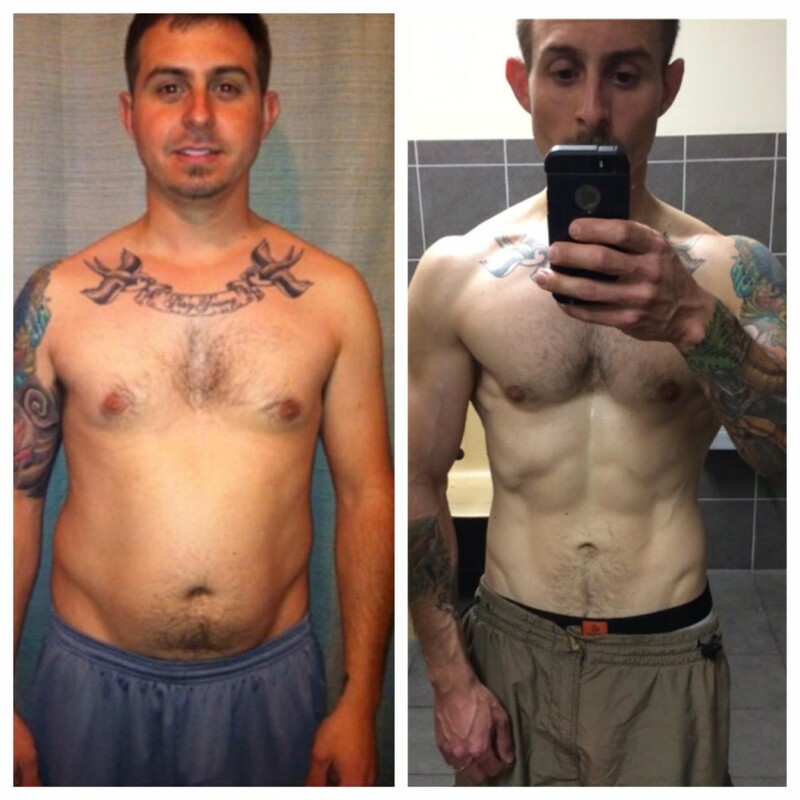 With the expertise of one of our trainers, he transformed his body composition from 22% BF to 5% BF! Mikes testimonial: “T Chan changed my life! He got a fat and lazy guy motivated to go to the gym, follow a strict diet and watch my body change. T Chan helped me lose 40 pounds, 7 inches off my waist, and double most of my lifting. 6 months going strong! The man knows fitness and I would recommend him to anyone looking to change their unhealthy lifestyles! Thanks again T”. 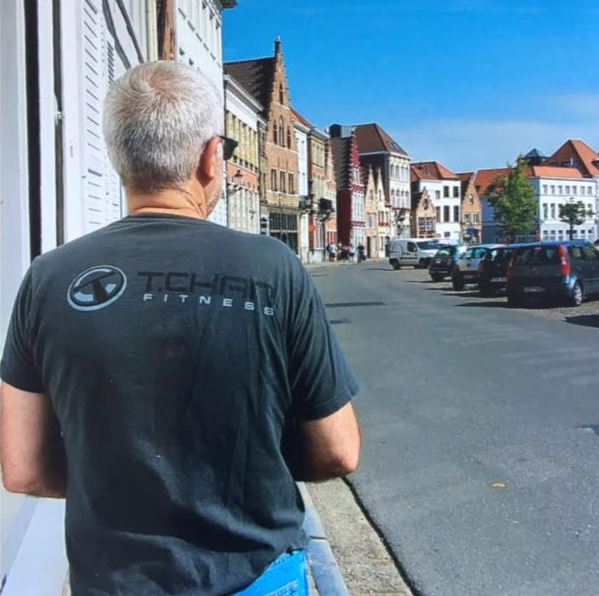 Check out this pic of our client Alan when he took a vacation with his wife to Belgium. Being the loyal, fitness fanatic client he is, he brought his old school throwback “T. Chan Fitness” t-shirt to represent our gym. The changes he made throughout the years are quite amazing. When he first met T. Chan, he wasn’t sure if he wanted to start personal training or not. He was afraid that it would aggravate his tendonitis and hip/glute pain. Later on, Alan got hip surgery and decided it was time to start personal training. T. Chan developed a fitness program which worked around his pain areas and now Alan is almost completely pain-free! Although Alan is our oldest client at 67 years old, he doesn’t let that number interfere with weight training 4x a week. At times he has T. Chan wondering how he survives some of the gruesome workouts given to him! T. Chan is the owner of Evolution Fitness and the head trainer. 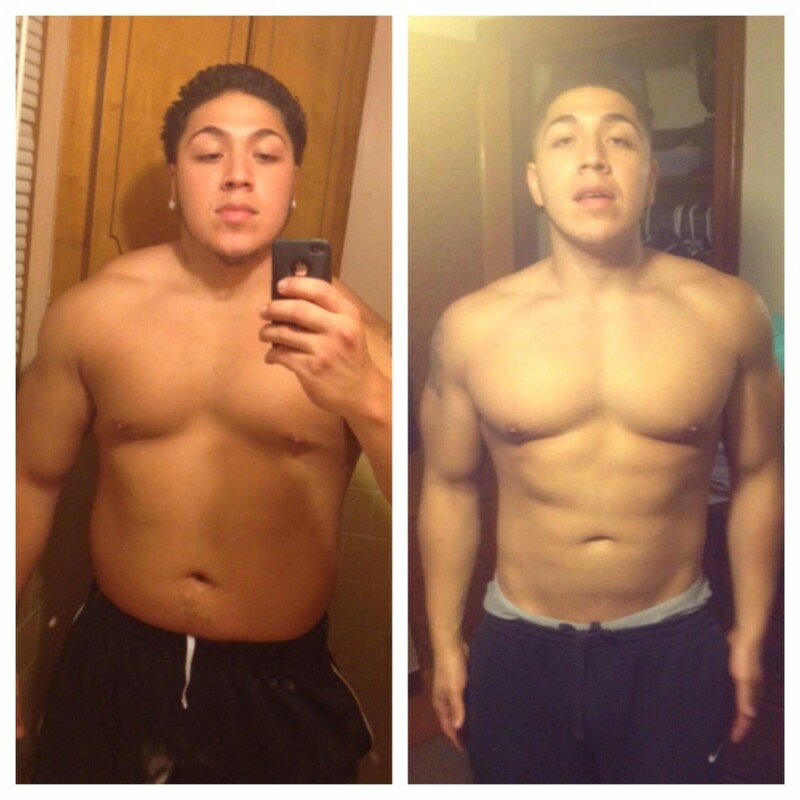 Right above is the picture of his 10-week transformation leading up to 3 days before his show. 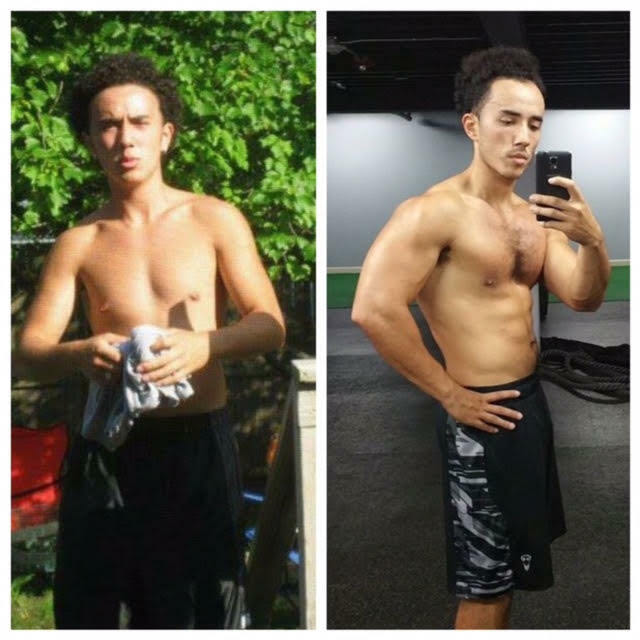 Believe or not, T. Chan wasn’t always the fit guy that you see walking around Evolution Fitness; he had to do a transformation just like all of his clients. If there’s anyone that understands overcoming life’s hurdles, it would be him. While growing up, he was always the shortest or skinniest guy in the room. To make things even worse, he had braces and terrible acne. At that time he was very insecure and always had confidence problems which lead to severe depression. 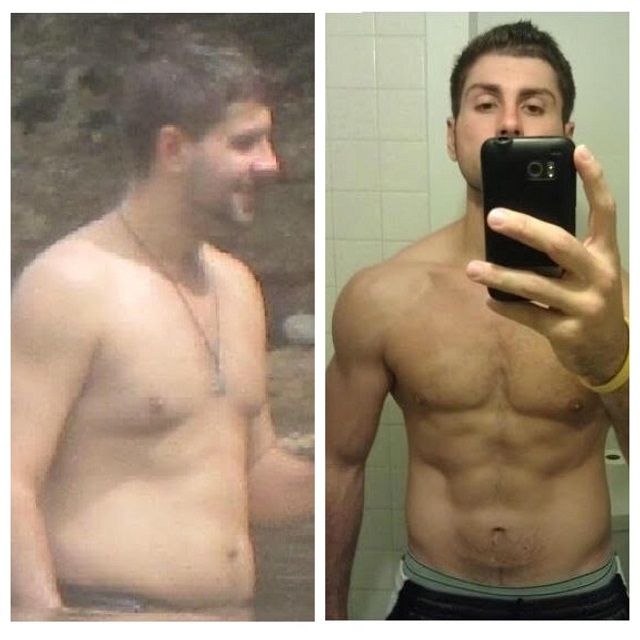 You can honestly say that weight training and becoming a personal trainer saved his life. 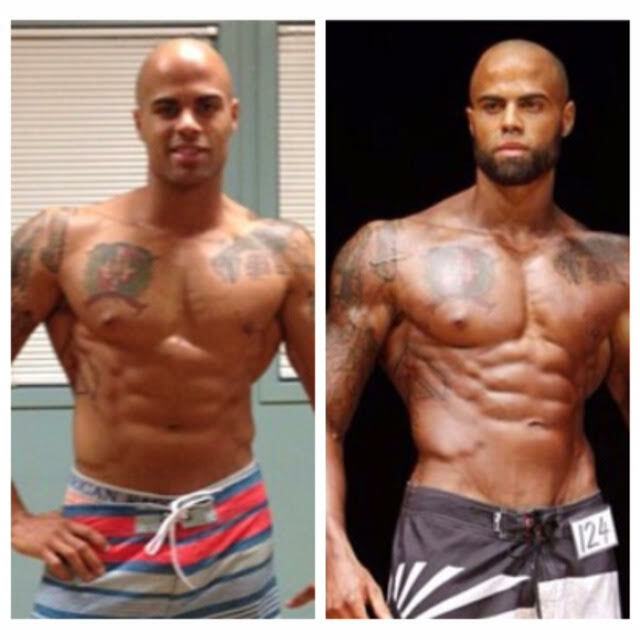 After years of intermittent weight training, he decided to do his first NPC Men’s Physique Fitness competition where he placed 2nd out of 8 competitors! All of his hard work and sacrifice paid off. Renee’s impressive 8-week transformation will get anyone motivated to go to the gym. She has been working with T. Chan and he has nothing but great things to say about her dedication and hard work. 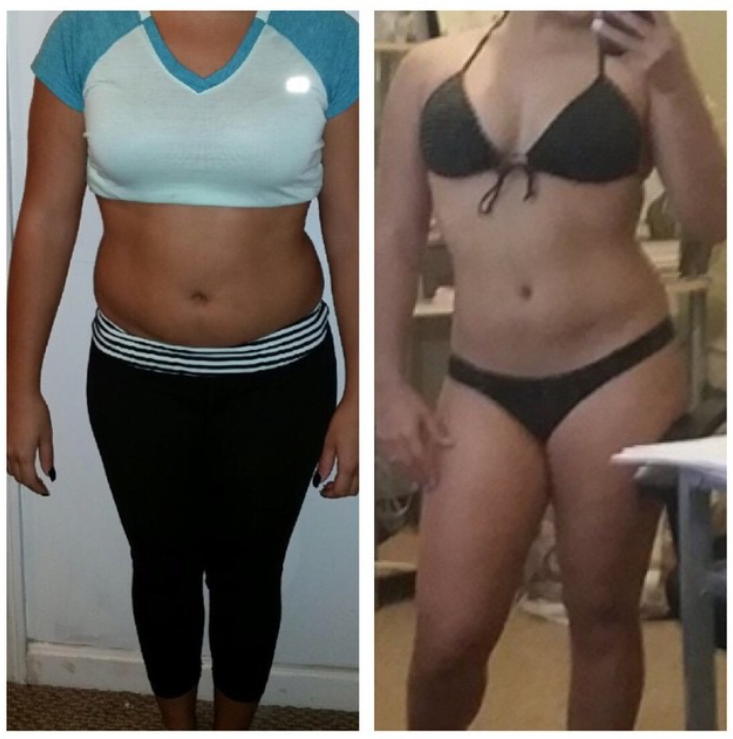 One of her short-term goals was to get lean for the summer, we can agree she achieved the look in a timely manner. So how did Renee do it? She followed a customized diet and weight training program designed by her coach, specifically for her. She did this about 6 hours a week and kept it consistent. With all that going on, she still maintained her daily activities and was working 60 hours a week as a registered nurse. When we first met Pedro, he was already in great shape. He wanted to do his first Men’s Physique competition and didn’t know where to start. He was referred to T. Chan from another friend. After a couple of phone conversations, they both finally met and Pedro hired T. Chan to get him ready for his first competition. For about 4 months we practiced posing routines, competition preparation, and different dieting methods that worked best for him. The end result? Pedro placed 2nd out of 15 competitors for his first competition at the NPC Jay Cutler Classic Boston! This client spotlight is long overdue and goes to T. Chan’s client Nazareth. With her own guidance, she started her own fitness journey to look and feel better. Later on, she was referred to T. Chan and they have been working together for the last couple of months. Following a diet and fitness program requires discipline. Naz made no excuses and definitely took the time to invest into herself while managing work, volleyball, and rugby. Her overall transformation is amazing; it’s clear she put on muscle mass and dropped her body fat percentage. T. Chan greatly admires the fact that she is coach-able. She put her mind to something and got it done. Keep progressing and being an inspiration to many others who want to start their fitness journey! Tanya found us through the Evolution Fitness social media pages and looked through our success stories portfolio and was amazed by the results that our clients achieved. She contacted T. Chan and the rest was history. With hard work, exercise, and dieting, the results stared to come. Three months have passed by and there is no turning back. She is currently down 30 lbs. Stay tuned, as her journey is not done yet! Good job Tanya, keep up the great work! With all his hard work and effort, it took him one month to achieve his new body fat percentage. He started at 16% body fat and is currently at 12% body fat. Stay tuned, as we will be posting updates on his journey. Carlos contacted T. Chan and wanted to decrease his body fat to make a weight class for a boxing fight. He was very excited and motivated to start his fitness program. We definitely have to give him recognition on his 2-month transformation. When he is handed a diet, he programs his brain and it becomes a machine, it’s all clockwork for him. Sometimes we worry about what our clients are doing, with him we know he is actually doing what we need him to do! He is now pursuing boxing and maintaining his diet. We wish him the best of luck in his future boxing endeavors! 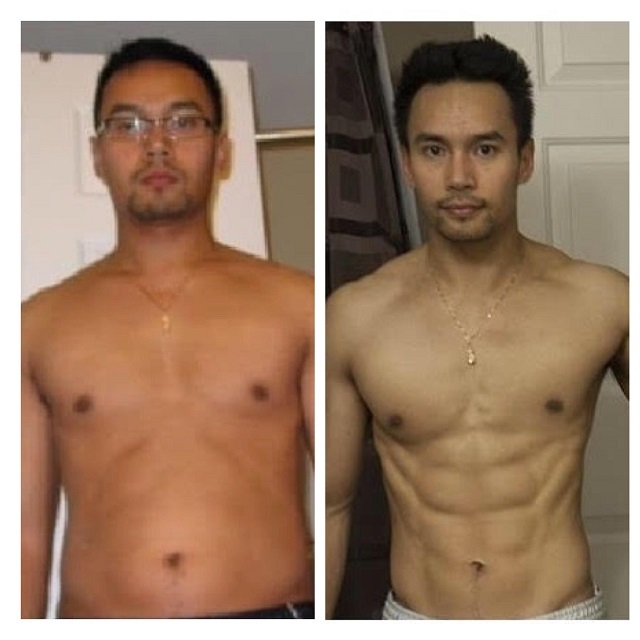 T. Chan’s brother/client Vathana was amazed at how he changed his life around and transformed his physique. That motivated him to start his own fitness journey and seek the physique he had always dreamed of. Nobody was more determined than he was. It was to the point where he didn’t even do any cheat meals! In the picture on the left, he was at 16% body fat and is a perfect example of being skinny-fat. If he wasn’t shirtless, you would think he wasn’t storing all that body fat. After 2 months of hard work, proper exercise education, and a customized diet program, he now stands now at 5% body fat. Sean’s fitness journey started all by himself, failing over and over. Finally, when nothing seemed to work, he decided to seek guidance in Evolution Fitness. When T. Chan first met Sean, he was at 12% body fat with no muscle mass, pretty much a skinny-fat body type. He had the impression that lots of cardiovascular exercises and no weight training was the answer to getting a low body fat percentage. Little did he know, there was a lack of strength training in his program and he was doing too many cardiovascular exercises. After one year of personal training and a customized diet plan, Sean was able to achieve his 5% body fat and pursued a career in male fitness modeling. Dan and T. Chan worked at the same gym as personal trainers, starting to become friends. 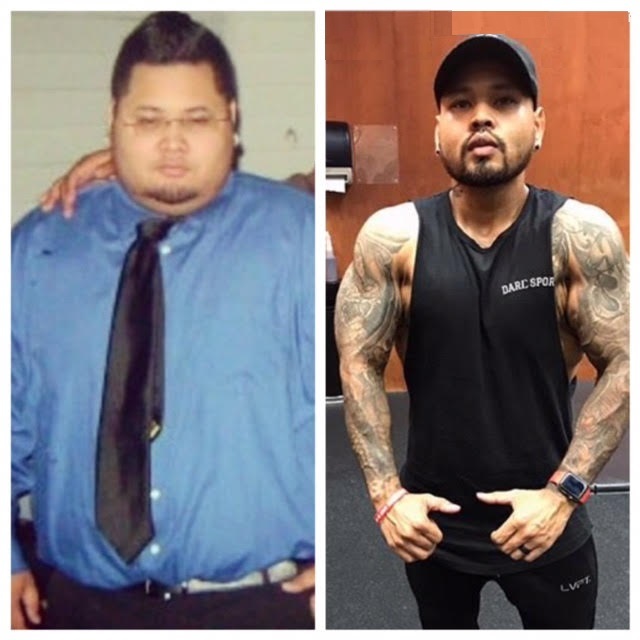 He approached T. Chan about the customized diet program that he offers, after getting ripped off by an “online trainer” that gave him a template diet that didn’t work. As you should know, most online trainers are very generic and give their clients the same paid information. How do they know if you’re losing muscle or body fat if your body fat isn’t being tested? To make a long story short, in the picture on the left, Dan started his diet plan and weighed 170.4lbs. After 2 months of dieting with T. Chan, he is currently at 153 lbs. Keep up the great work Dan! Gerard’s transformation took about 4 years. He noticed changes with his body every week and become obsessed with how he felt. The change that he made on his own was unbelievable. He started at about 35% body fat and over 300 lbs. and now is at 9% body fat. T. Chan helped him with his dieting for a couple of months when he reached a plateau and took his physique to the next level. Gerard is currently an EMT and is considering becoming a Personal Trainer. This 10-week before and after shows that age is nothing but a number. T. Chan’s client is Richard is 43 years young, but his physique would tell you otherwise. During our initial consultation, we went over Richard’s health/exercise history. At this time, he was following a low carb diet and suffered from brain fog, lack of energy, muscle weakness, etc. With T. Chan’s numerous years of dieting experience, he immediately knew what diet would work best for him. Dieting clients of all fitness levels have become a sixth sense for him. T. Chan compares it to predicting the stock market, but with the human body. Check out our trainer Jonathan Vasquez’s client Nairoby. When she first started training, she had mixed ideas about weight training and its benefits. Also, she didn’t have any proper knowledge about nutrition. With two months of consistent weight training and a solid customized diet program with Jonathan, the results started to come. In the picture on the left, she is at 136 lbs. and the picture on the right, she is 126lbs. Now you might think that 10lbs. won’t make such a difference, but it does especially when she gained some muscle through weight training. 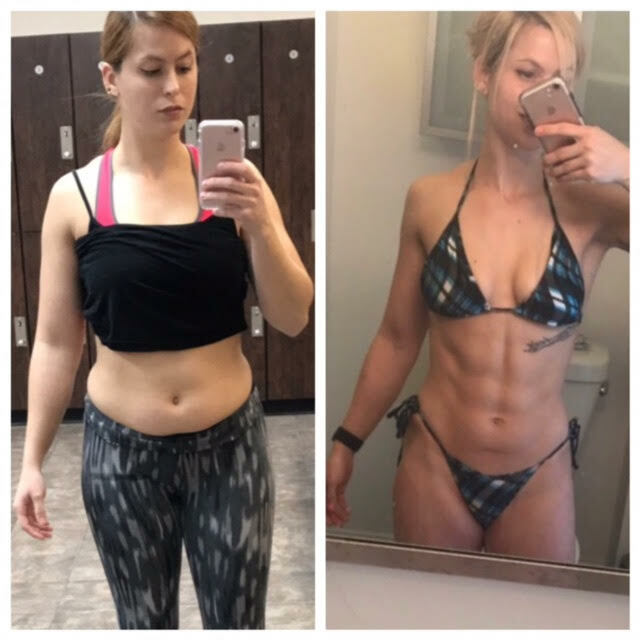 She went from barbell squatting 55 lbs. to now squatting 135lbs. for reps! Not only has she decreased her body fat and lost inches from her body composition, she got a proper education to live a healthier lifestyle from Evolution Fitness. Great job to our client Luidas and our trainer Tyler for bringing a great package last month to the NPC New England Championships. The judges seem to agree and handed Luidas a trophy, leaving him to place 3rd in a stacked class! With his coach Tyler’s superb dieting methods and the help of T. Chan for posing, we are both extremely happy with the outcome. Stay tuned Luidas will be back for more in April 2017 with an improved package! Lonnie and T. Chan were childhood friends and have known each other for over 20 years. At one point they hung out together every day for years. He noticed that T. Chan was going to the gym a lot more and saw his physique change in a short amount of time. Before you know it, they were going to the gym together. In the beginning, Lonnie was really out of shape and could not control his eating habits. His metabolism was a wreck – it was eat nothing or eat everything. After working out together with T. Chan and proper education on dieting, the new Lonnie was here! He started at 200 lbs. with 28% body fat and 5 months later he was weighing 170 lbs. at 12% body fat! As is the case with many women, Julia wanted to tone up but not look too muscular. She had the impression that weight training would make her bulky and was very skeptical about it. She called Evolution Fitness and did the free fitness consultation with T. Chan. He quickly removed that false statement out of her brain. She put her trust into Evolution Fitness and got nothing less than results. She started weight training consistently 2-3 times a week and was a believer. Her starting weight was 152 lbs. at 29% body fat and 3 months later she was 134 lbs. at 21% body fat with some new muscle mass. Julia is now faster, leaner, and stronger while still keeping her figure. Jonathan Vasquez, one of our trainers at Evolution Fitness, has been working with JC for 6 months now. Hard work and dedication, along with consistency, will get you results. The word “can’t” does not exist in JC’s vocabulary. Against all odds, he had to push himself to this point of change. He has been steadily dieting on Jonathan’s customized diet plan and training with him 2x a week, leading him to lose 60 lbs. and 12% body fat! When starting a fitness journey, your goal shouldn’t be a temporary fix, but it should be more of a lifestyle change. Too many people think there’s a magic drink or a pill that does all the work for them. The truth is, there are three things that work together, a good diet plan, weight training, and cardio. All three must be strategically put together with consistency. Keep up the good work! We can’t wait to see the finished product! Who would have thought that 3 weeks of dieting and personal training could produce results like this? Tommy already had a lot of fitness experience but was a stranger to following a structured diet. Being the owner of a high-end body shop in Warwick, R.I, his schedule was extremely busy. T. Chan designed a customized diet plan that was convenient for his schedule. It may be hard to believe, but we didn’t use any supplements besides a protein powder for a meal replacement when he was too busy for food. 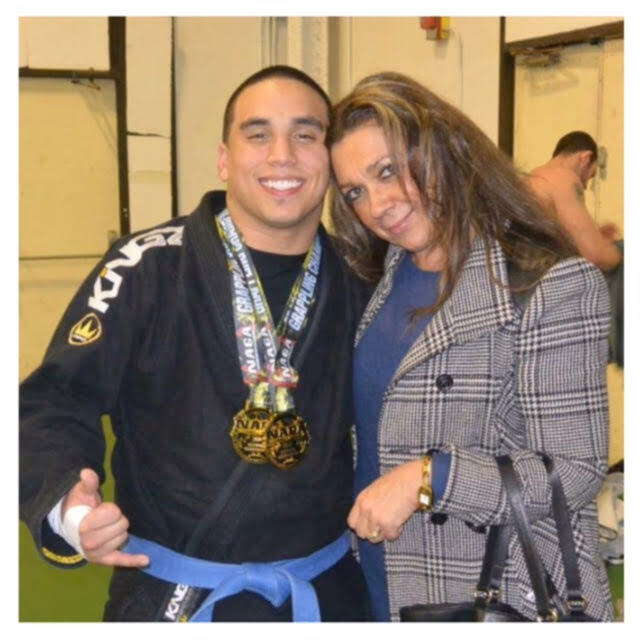 We must give a round of applause to our client Angel for winning two gold trophies (first place) at the Brazilian Jiu-Jitsu NAGA New England Grappling Championships. With T. Chan’s dieting/coaching protocols and all of his hard work, he lost 25 lbs. of fat and some water weight in 2 months. Angel was not on any starvation diet; he was properly fed with good carbs which kept him feeling good. Yes, this is a lot of weight to lose in 2 months; we had to do some water manipulation techniques to make sure he made the weight cut. We made sure that Angel was fighting at optimal levels and decided what macronutrients worked best for him. You made us proud, and more trophies should be coming soon! T. Chan’s cousin Vannara was always into weight training and staying healthy but could never figure out how to get a lower body fat percentage. 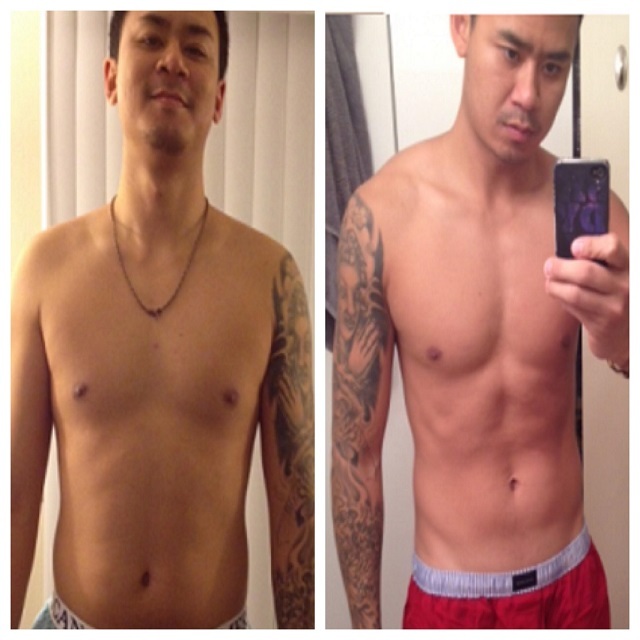 T. Chan would always show him amazing transformation pictures of his clients. He decided to give it a chance and started to do one of T. Chan’s specific weight training program while following his customized diet program. 10 weeks later, and there you go, a brand new Vannara with his 6-pack showing! Here is Sy, one of our trainers at Evolution Fitness. The picture on the left is in 2008 when he was weighing 175lbs. and the picture on the right is in 2015 he was weighing 197lbs. 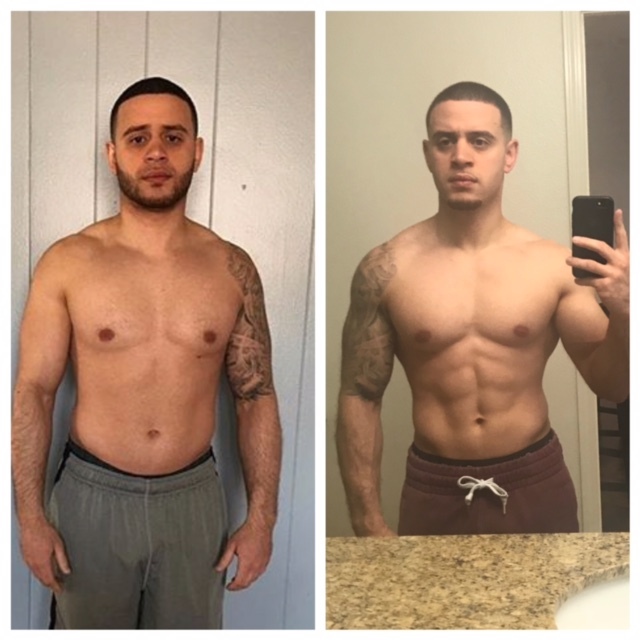 He started weight training in 2010 after graduating high school with little knowledge in the fitness field and a simple goal of getting bigger. He was in the gym 3-4 days a week, chasing after the “physical high” that weight training gave him. 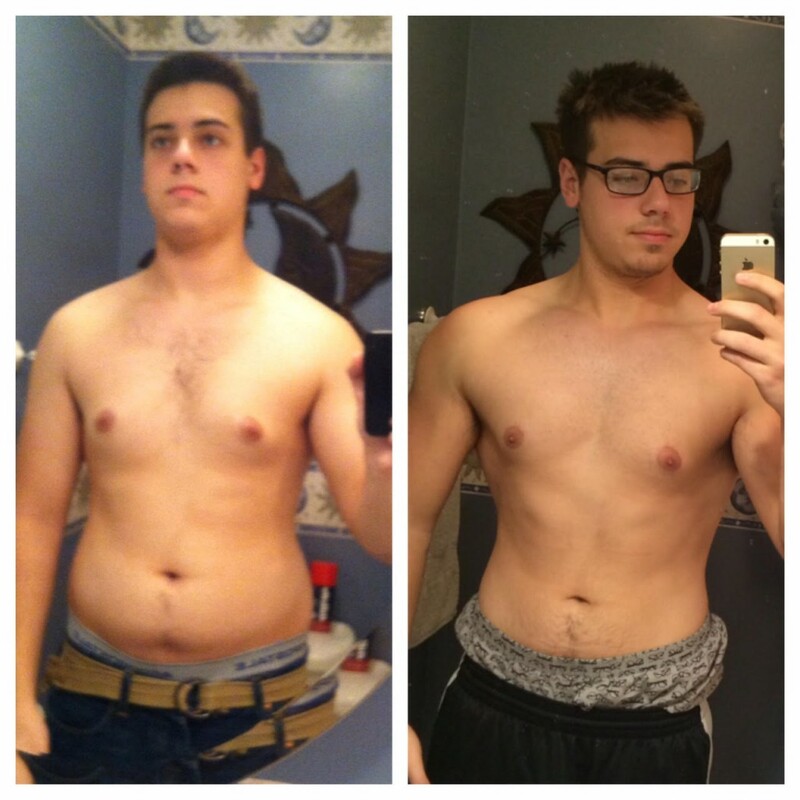 He started seeing great results after the first 6 months and was completely hooked. He was getting bigger and stronger, but the one thing that he had trouble with was getting his abdominals to show. He was always weight training but not worrying about his diet. Sometimes he was eating too much and a lot of the time he wasn’t eating enough! He eventually ran into T. Chan at Evolution Fitness this year around March, where he also applied to work as a personal trainer. 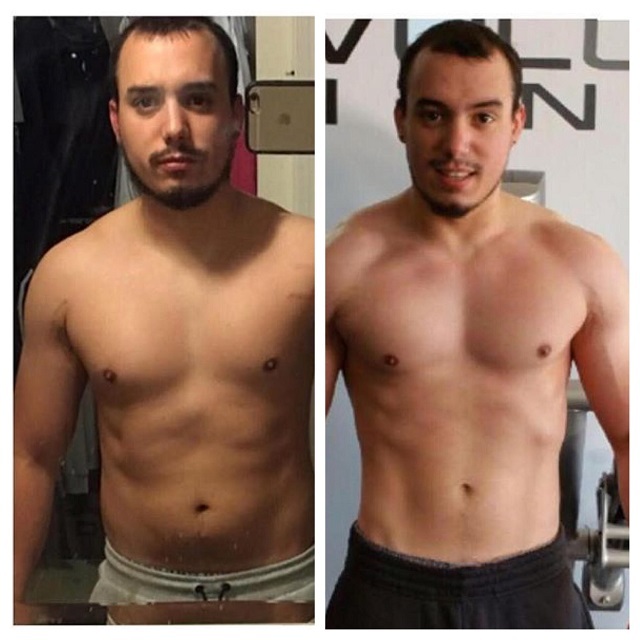 Ever since then, T has taught him some proper dieting techniques which he is currently using for himself and his clients. This picture is only the beginning of what he wants to accomplish with his physique. Sy is looking forward to seeing what he can achieve with his new knowledge and continuing education for himself and his clients! This is what happens when you follow our trainer Sy’s fitness plan! 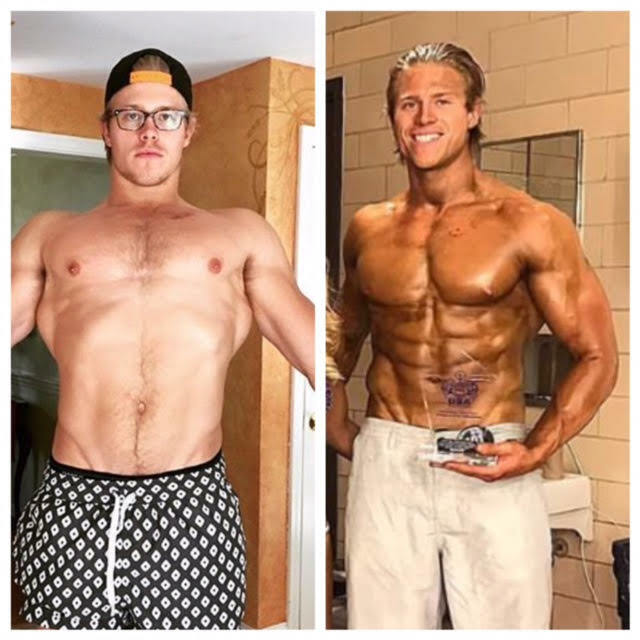 Dev’s 4-month transformation so far is nothing short of amazing. The left is around July at 164 lbs. and the right is October at 146 lbs. At first, progress was a little slow due to his habits of going out to eat burgers and steaks accompanied by a few beers a little too often! This brought him over his calories every time. But once he got a hang of tracking his food intake, we started consistently losing weight without killing him with cardio. In fact, we don’t even think he was doing any more than an hour a week (if that) for this transformation. Dev still incorporates his burgers and steaks into his diet while making progress. Yes, you read that right. We also allow the occasional beer here and there because people need to sit back and enjoy a cold one every now and then. Keep it up Dev! With your hard work ethic, Sy’s going to turn you into a beast. Kune started his fitness journey by himself and got some information from fitness websites. He noticed that his progress with losing weight wasn’t getting anywhere. After seeing all the great results at Evolution Fitness, he decided to seek professional guidance. Kune’s starting body fat was 23% and after 3 months of the Evolution Fitness Diet Program with T. Chan he lost 7 inches from his waist, 30 lbs. of fat, and is now at 12% body fat. What a great accomplishment! 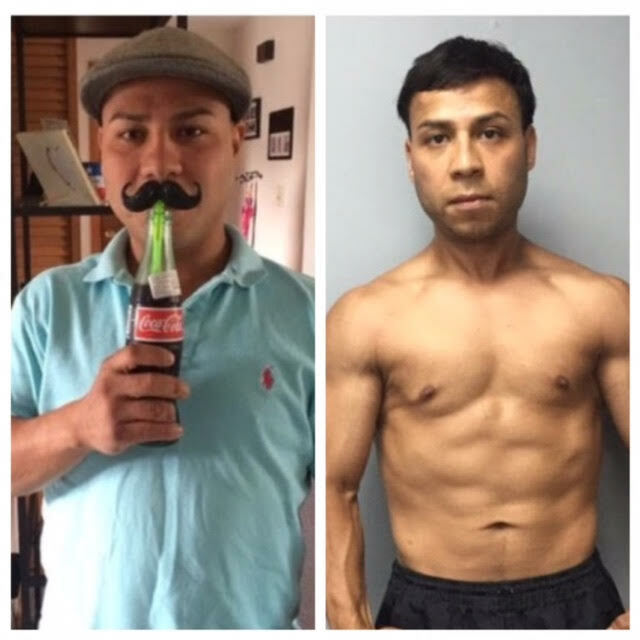 Here is Abner’s amazing 2-month transformation. Some of the Evolution Fitness transformations may be hard to believe. We promise they are all real and done in the timeframe that was provided. Abner has known T. Chan since high school (about 12 years ago), they had some of the same teachers and shared similar interest. Abner was really active in high school; he played on the soccer team and football team. As life passes by, we get busy, becoming stressed out by life and letting ourselves go. He decided to make a change and contacted Evolution Fitness on Facebook. T. Chan put him on a customized diet, he trained twice a week for personal training, and the rest is history! All it took was 8 weeks! 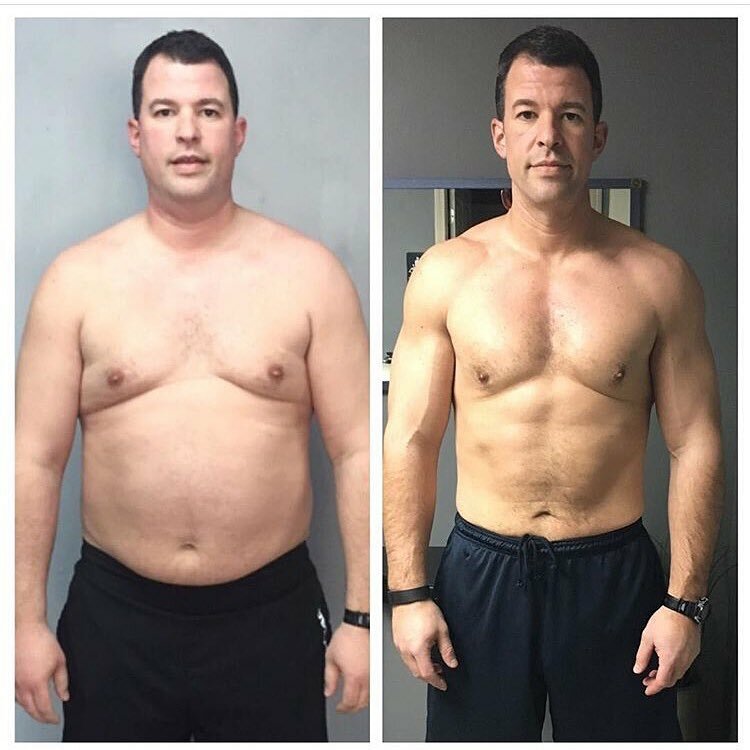 This is the 7-week transformation of T. Chan’s online client, Gary, who lives in New Hampshire. Gary found us on Instagram and decided to give us a shot. He went as far as checking all the Facebook and Yelp reviews to make sure we weren’t a scam, especially considering that he lives hundreds of miles away. Gary has tried many diets in the past, a lot of the diets he tried were cookie cutters and had high caloric restrictions. After working with T. Chan in the first couple of weeks, he couldn’t fathom how many carbs he could eat while still decreasing his body fat and maintaining his strength! The total weight loss for this client was 13.4 lbs. What a difference that losing pure body fat can do to a person’s physique. At the moment, Gary is complaining about getting too lean. What a horrible problem to have, Gary. Our solution? More cheat meals! Keep up the great work Gary! 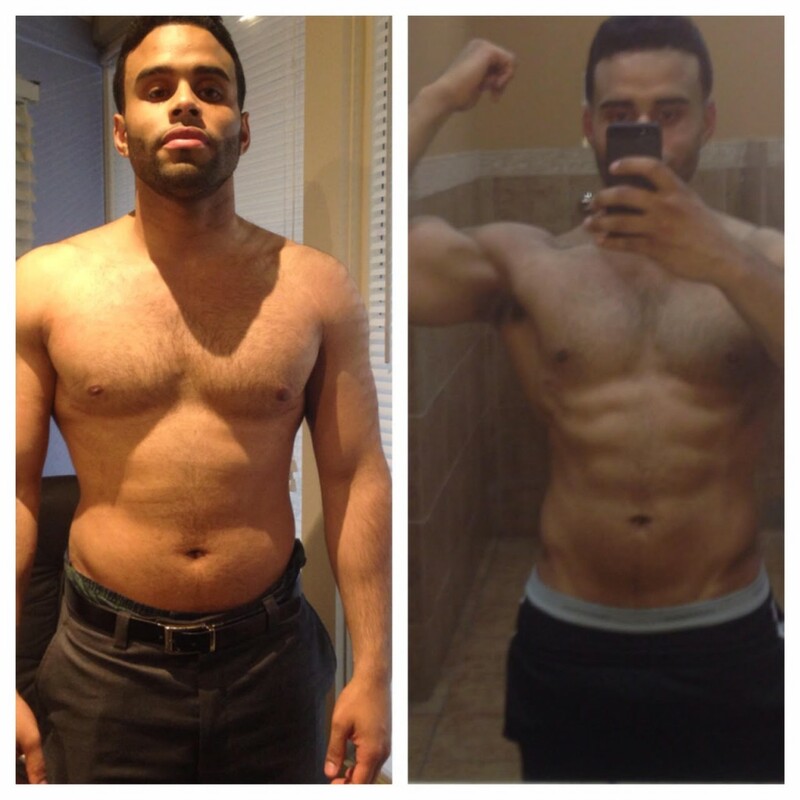 Check out this 10-week transformation from T. Chan’s friend/client Manny. His journey started via a referral from one of his friends. He started to follow our social media pages on Instagram and saw the many transformations that Evolution Fitness has had over the years. With proper dieting and weight training education taught by his personal trainer T. Chan, the results for his perfect physique followed. Manny is shocked that he can still enjoy life and still maintain his results. 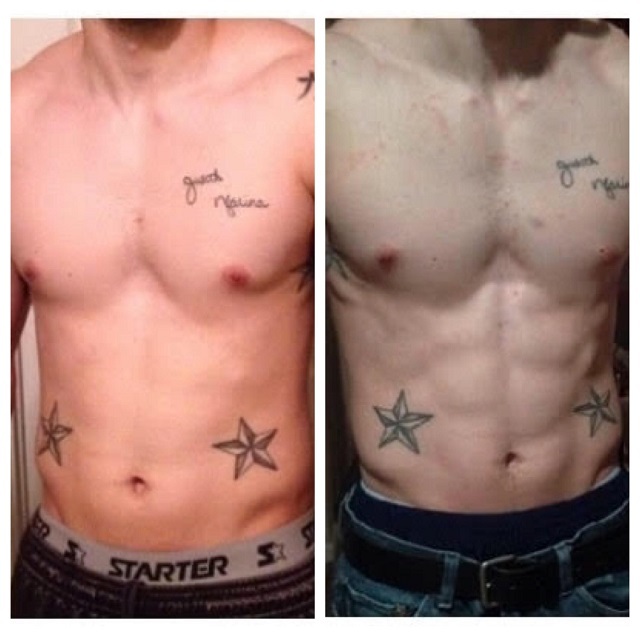 His before pictures say it all – he clearly has a decreased body fat percentage with an increase of muscle mass. T. Chan thanks you for all the hard work and dedication you put in. He wishes you the best luck in California and all of your future endeavors. Stay tuned for updates of his next transformation pic. 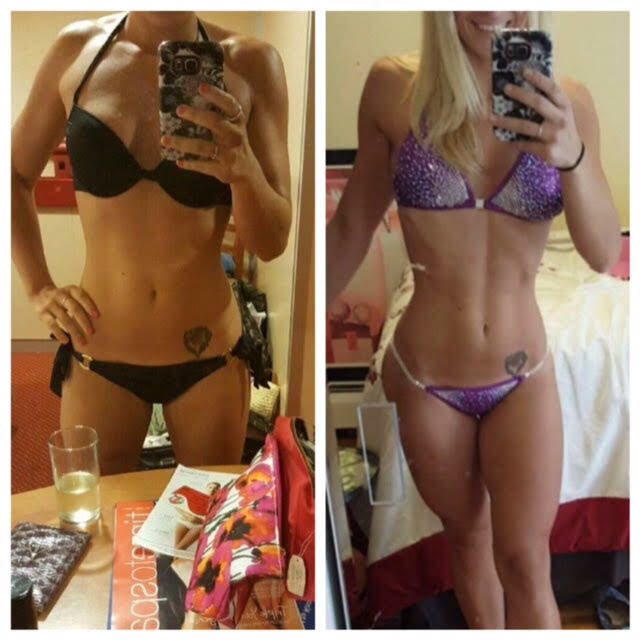 Here goes another great transformation from Evolution Fitness and our client Rachel. 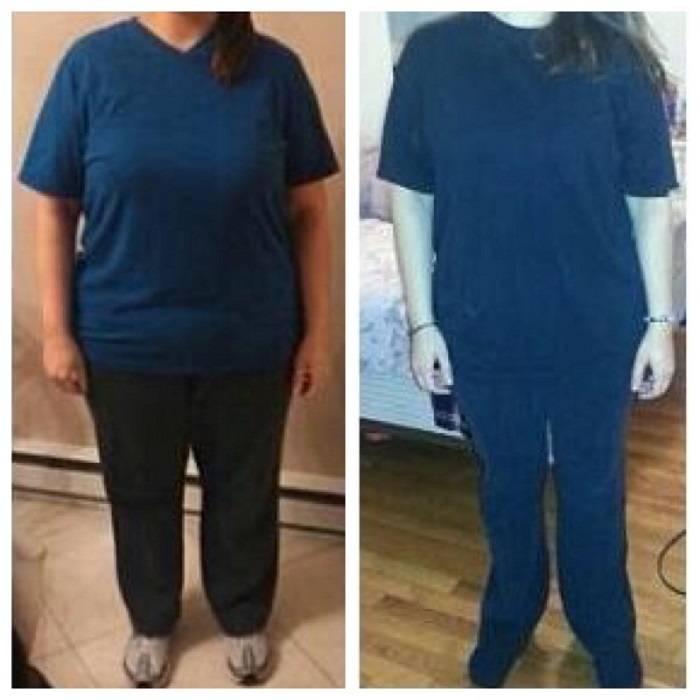 She has been working with T. Chan for the last 3 months and is currently down 25 lbs.! It is even more impressive that she lives about 1.5 hours away and still finds the time to come down and ascertain her body fat with our state-of-the-art Inbody 570 body fat scale. That right there is dedication! Many people will be inspired to start their fitness journey because of you. Let’s keep the fitness mission going! Giovanni and his 18-week transformation are nothing short of inspirational. 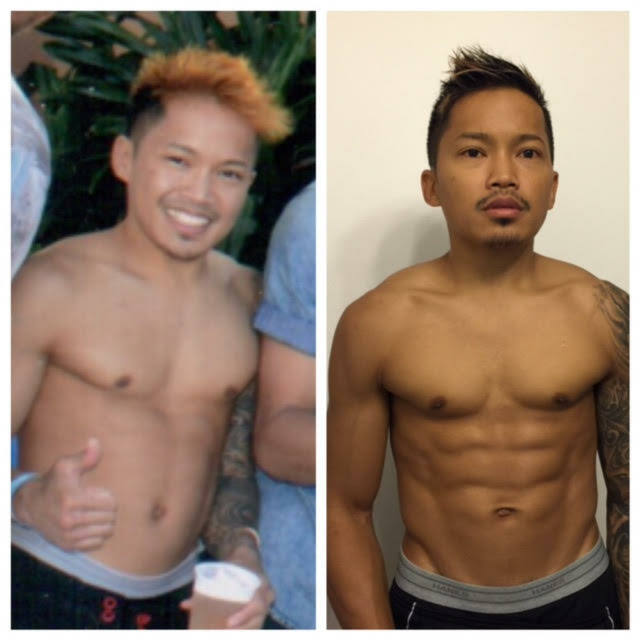 When he first started with his coach T. Chan, he was coming off from a boxing regiment and was following a diet program that lacked the proper macronutrients and exercise. From the picture on the left, he was overeating and didn’t exercise much. He lacked muscle mass – this happens from too much cardio, starvation diets, and not enough weight training. The picture on the right is his after picture. It looks like he gained about 15-20lbs. of muscle mass. In actuality, he only lost 20 lbs. of body fat and increased his muscle mass. Losing body fat correctly does wonders to a person’s physique. T. Chan writes “Working with Giovanni is a breeze for me, he is a ‘yes’ guy, he is a machine. I’m not sure if he even sleeps? Any time I needed him to do something, it was always “yes”. Let’s take the time to spotlight Jason and his outstanding transformation. 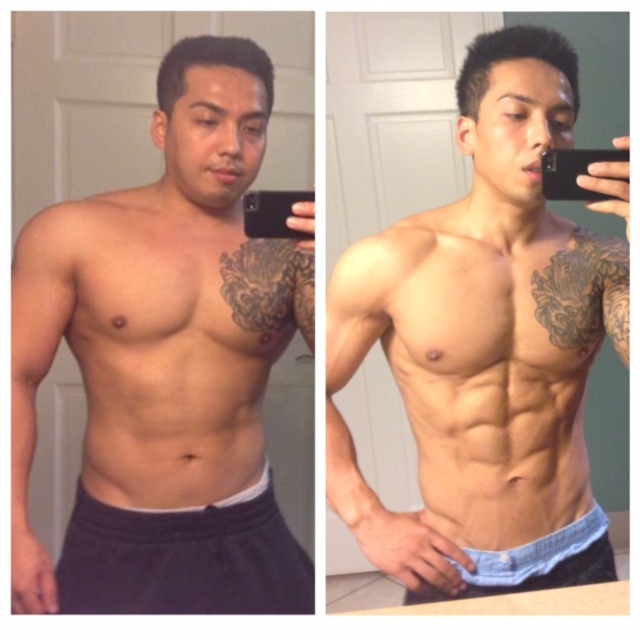 He has been working with his coach T. Chan for the last 8 months and is currently down a total 15% body fat, 45 lbs. of unwanted body fat and 12 inches off his waist.